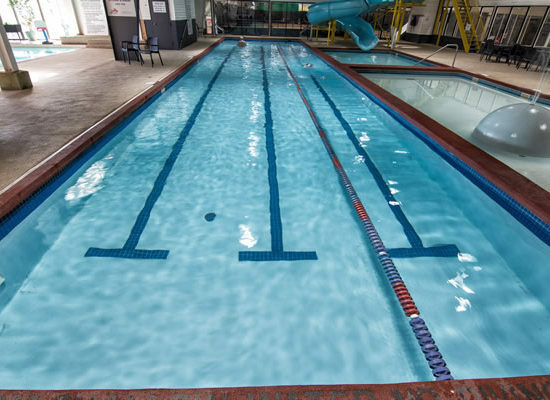 At Cedar Springs Health, Racquet and Sports Club, we pride ourselves on a modern and unique aquatics experience for the whole family, with indoor and outdoor pools, waterparks, slides, and more. Cedar Springs has 8 pools, which allows us to provide different types of swimming and learning experiences. Our indoor/outdoor waterpark, waterslides and pools make for the perfect location to host kid birthday parties and team parties, and our swimming lessons help parents feel comfortable knowing their children are safe. In the summertime you cannot find a better private outdoor oasis than Cedar Springs. No matter your swimming level or ability, whether you hope to work up a sweat in the pool or splash with the kids, come see what we have on offer at Cedar Springs Club. At Cedar Springs, we have not 1, but 8 pools! 5 indoor and 3 outdoor pools (1.4m depth) means there’s a temperature, fitness level, activity level and depth for every member of the family, with lots of space to move around (and less elbows and knees bumping your stroke!). We have a kiddie pool that has warm temperatures and a gentle slope without too much depth. Outdoor pools are heated to ensure you stay comfortable during your swim. There’s also the lane swim pool, outdoor pool, 25-metre swimming pool, and lap pool that is a perfect 1.2 metres deep. And if you’re trying to clock your pace speed, we have a large clock on the wall that is for perfect pacing.